Please excuse my long absence, work has been fast and furious. Here is the poster commissioned for San Diego Comic-con 2017 for the TV series Gotham. 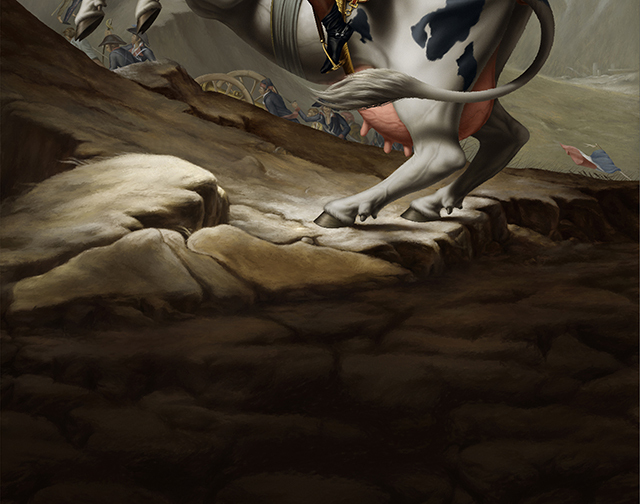 It was a crazy deadline but the nice people I was working with, it turned out to be fun! From left to right front: Bruce Wayne/ Batman (David Mazouz), Commissioner Gordon (Ben McKenzie), Harvey Bullock (Donal Logue), in the background: Alfred (Sean Pertwee) and Leslie Thompkins (Morena Baccarin). Some last minute adjustments: main puddle: an upside down crown, top left: a paw for Tigress (Jessica Lucas), a penguin shaped puddle (bottom left) for the Penguin (Robin Taylor), a cat’s head (bottom right) for Cat Woman (Carmen Bicondova), a crown (top left) for Barbara Kean (Erin Richards), a question mark (top right) for the Riddler (Cory Michael Smith). 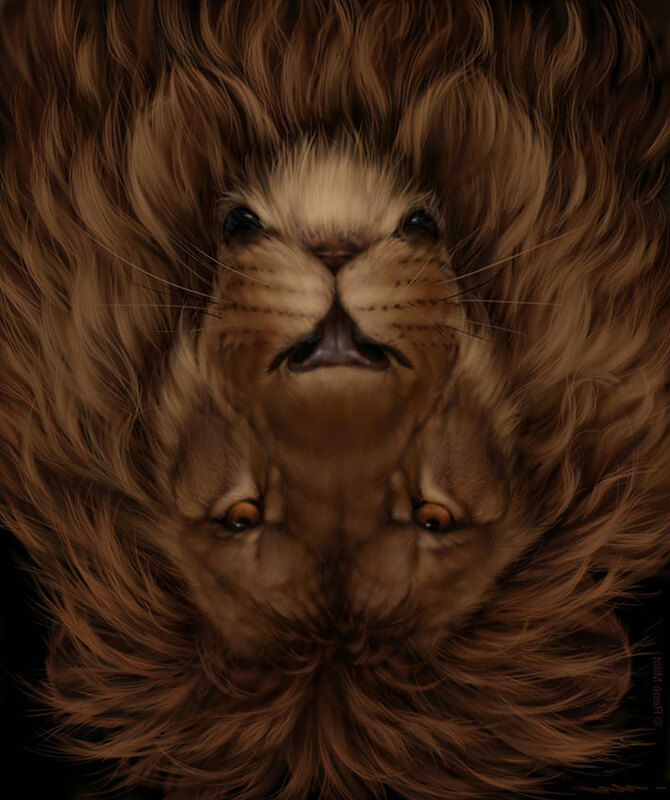 Lion, mouse an upside down illustration project! A little while ago, a fun project came my way, combining 2 elements that had to be seen upside down as well as right side up in order to discover the other element. 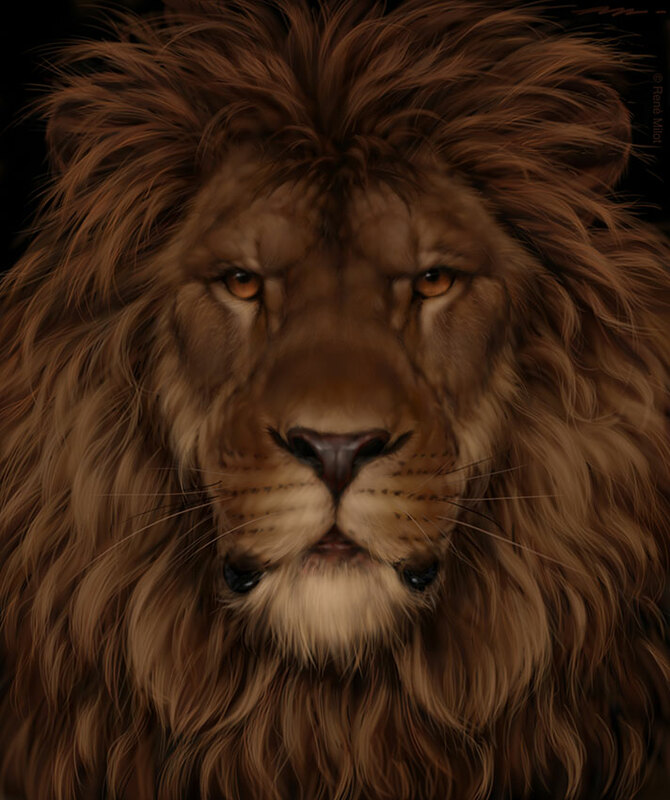 In this case: lion and mouse. Technically it was tricky and challenging, but the concept was so cool that it was worth it. As always, a last-minute project: cool but quick deadline! 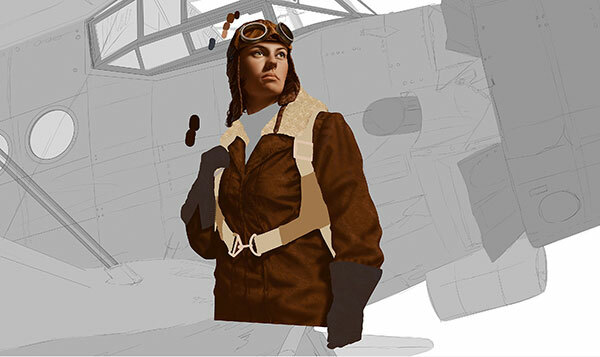 The illustration required was for an article about the brave women who pioneered aviation. The brief was simple and direct: just a depiction : straight forward: which is fine since I had a day and a half to complete the project! 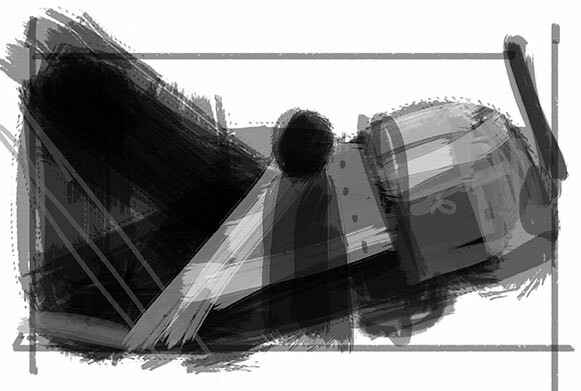 As it happens so often: no time was spent on the sketch details: I knew that it had to be graphic and direct. 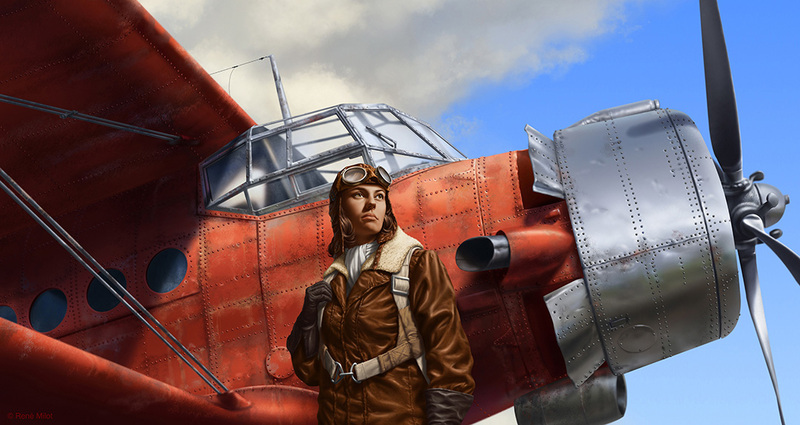 To all airplane lovers out there: please accept my apologies for not depicting an actual aircraft model: I create an airplane of a certain era without worrying about the accuracy of the model: the idea that was provided to me; was to give the “impression” of a by gone era. 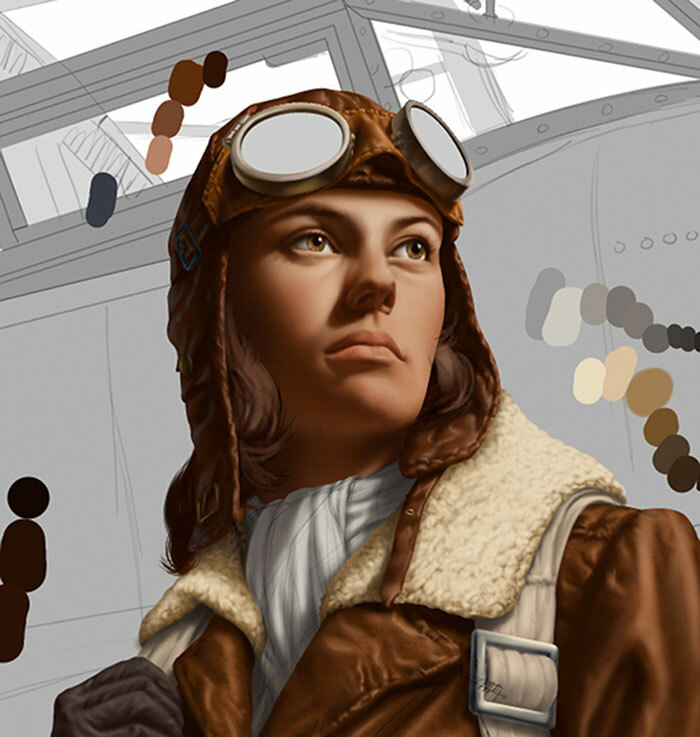 The same principle applied to the aviator: a generic approach was requested by the art director. 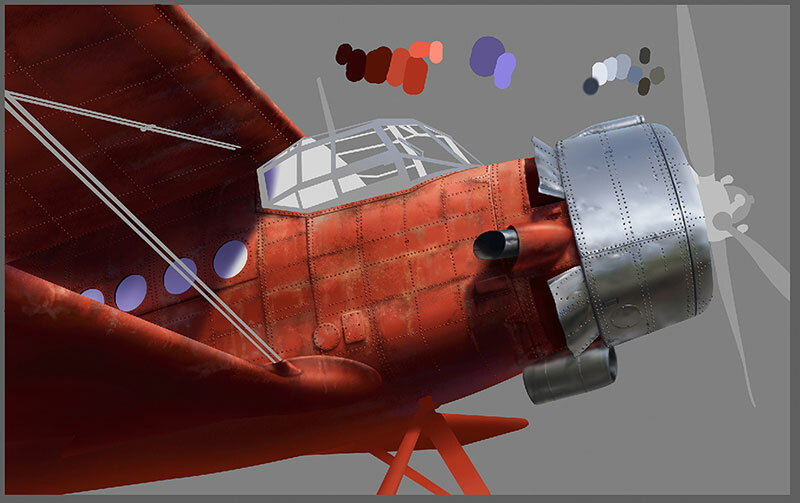 When it came time to render the airplane, I knew that I had to put some rivets to evoke a vintage plane. 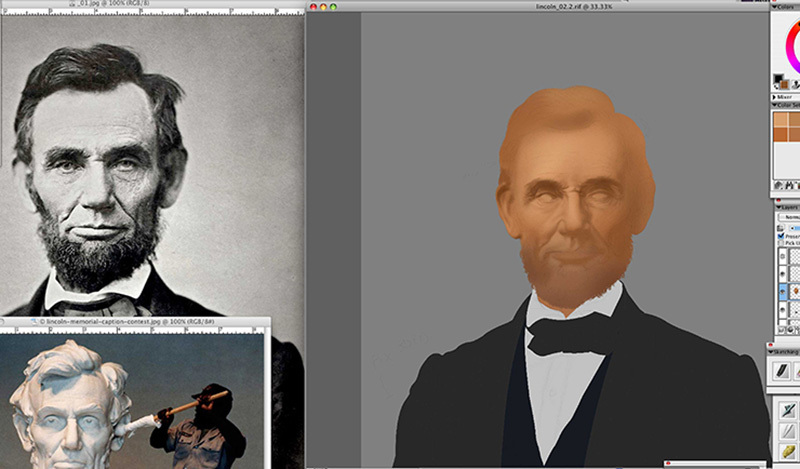 As I started rendering I knew that I could rely in Photoshop or Painter in the action: “copy and paste”. 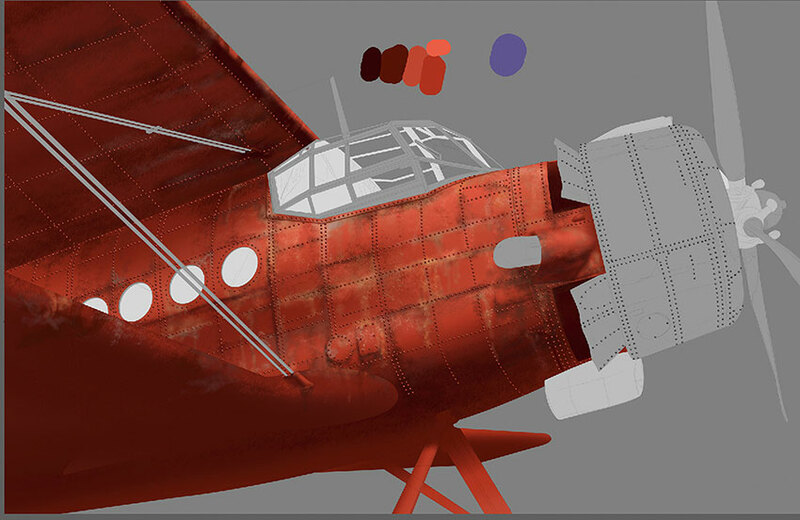 So therefore I did not have to render every rivets… famous last words! 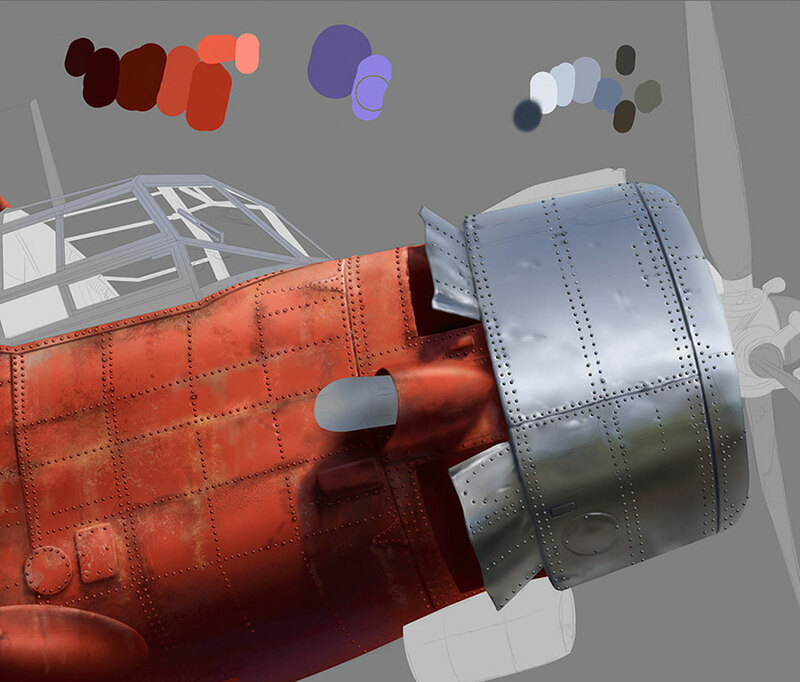 And it went on and on: rivets, rivets and more rivets! After this riveting endeavour, the assembly process was easy: and turned out OK for a day and a half of work! Since I had to decide what elements to include: cogs, textures etc: selecting elements that would populate the image while giving a context. 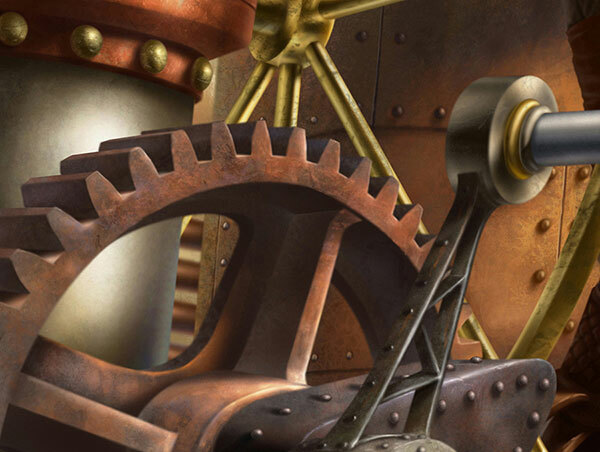 As I stated earlier, because steampunk is a favourite theme; cogs, gears, rivets, rust, metal had to be providing information without an overkill of indulgence. 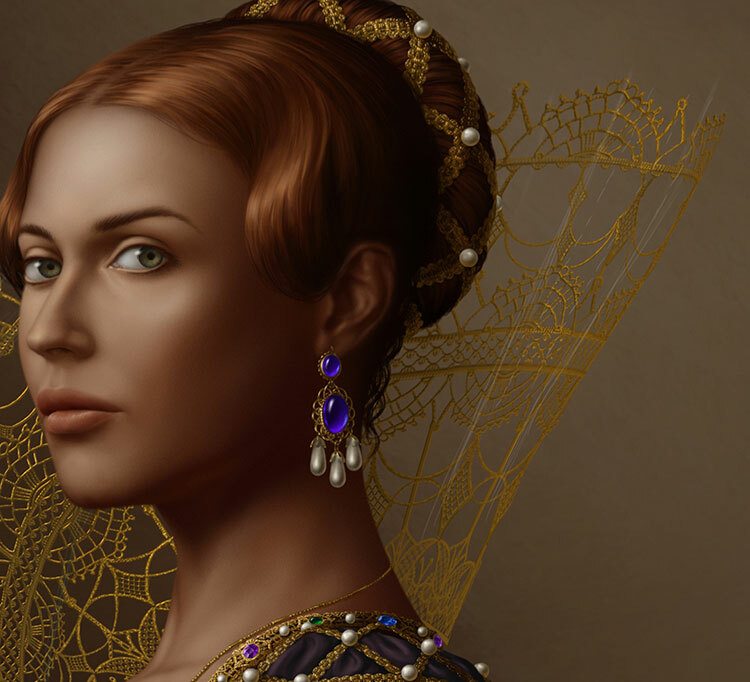 Having made the decision to tone down the amount of elements in the illustration, a variation of material was needed to enhance those elements and provide them a platform of diversity. With different types of textures and metals playing with light will add an extra dimension to the painting’s dynamic. 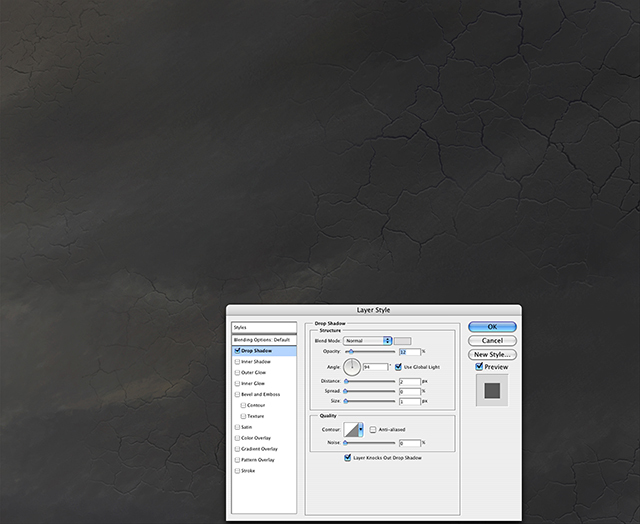 I mostly work with Corel’s Painter (with a bit of Photoshop) and just like Photoshop, you can create textures to add that extra illusion of surfaces. That way of composing an image in my case always provides me with that freedom of expanding the importance of certain elements: juxtaposing shiny against raw distressed metal. Using the rivets like music beat tempo, little notes bouncing around: just like a rhythm. Almost done, one of the things I like is to have a selection of good artist friends and some of their comments are worth listening to. In this case, an art director and painter friend of mine pointed out the fact that an area was a bit busy. 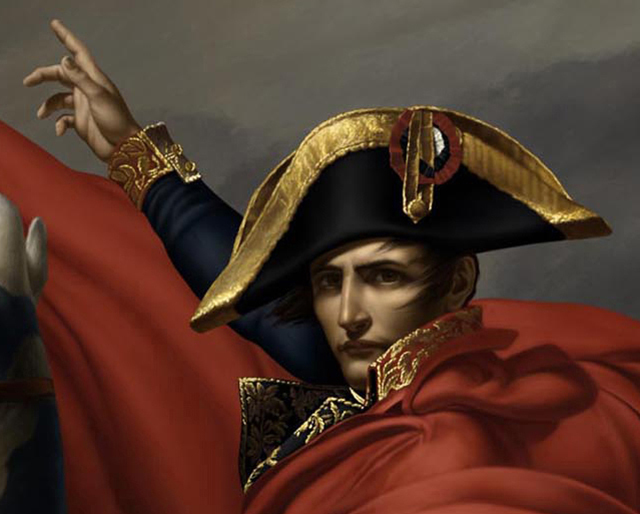 The Victorian style metal details holding the canvas canapé was a bit heavy to my friend’s eyes: he felt that it drew the eye towards the back of the painting. After trying different looks and sizes: I simply removed it and agreed with his observation. I think it makes for a better composition. Here are a few details of the final art. Interested in a print, please go to my website http://renemilot.com and shoot me an email! First let me say, sorry for the gap between postings. It’s been a very busy time with work and with life: freelancing is not a predictable time management endeavour! 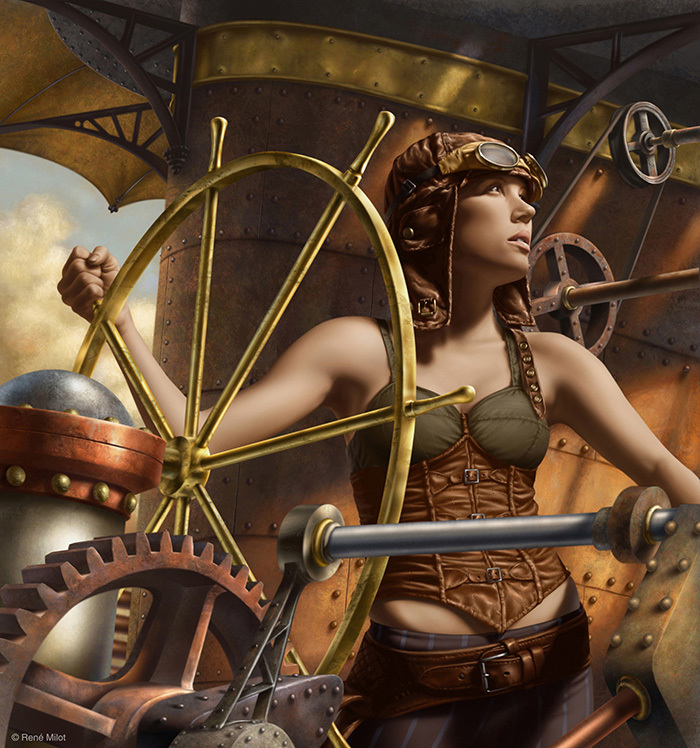 At last, a “steampunk” themed illustration! I have been dying to do one for a long time: I love that theme: great visuals, great elements, etc. As always my deadline was tight, as always the freelance reality was there: make it quick and on time: here we go again. 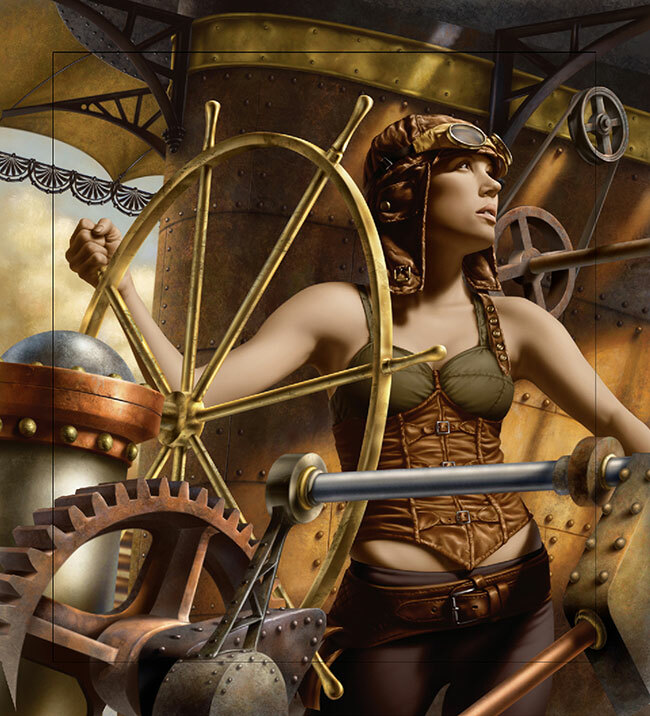 One of the many reasons I like the steampunk theme, is that it covers of lot of my interests when painting. 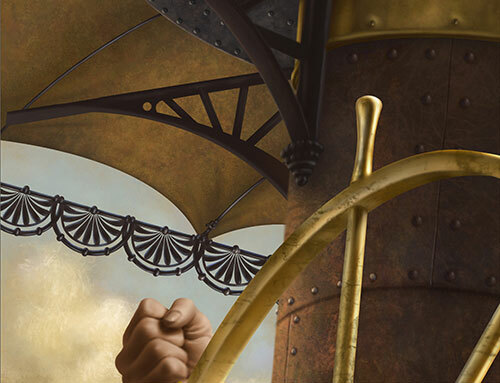 It has an historical angle, a costume element, a science fiction flavour and a touch of “fantastical” machinery! 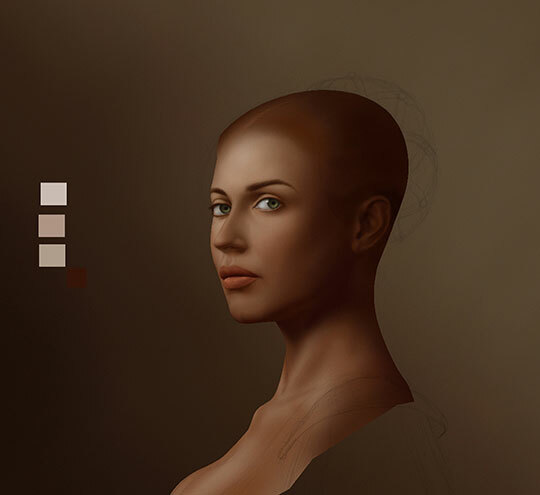 Like previous posts, it will be a step by step process demonstration: I always hopes that it helps someone in their journey into creating an image. 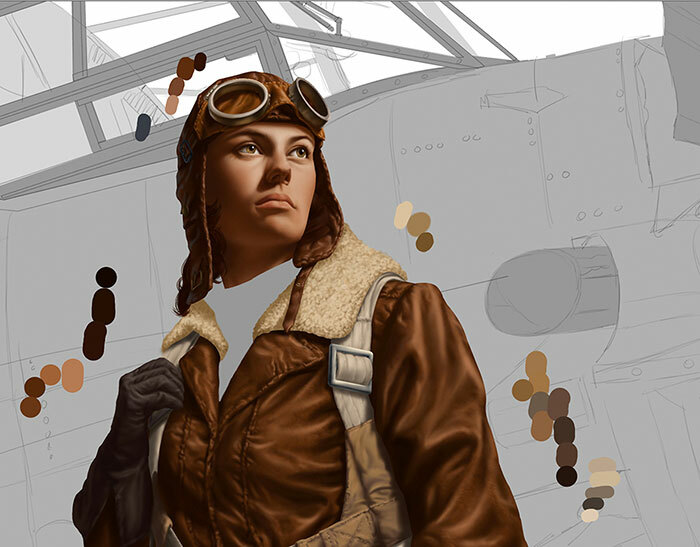 This process and the image was also featured in ImagineFX magazine, as a step by step featured article using Corel Painter software. This illustration, literally came out of a doodle sketch: I had and idea from the start, of what was needed for the assignment: and mostly the dynamic of the elements: shadows, textures, etc. 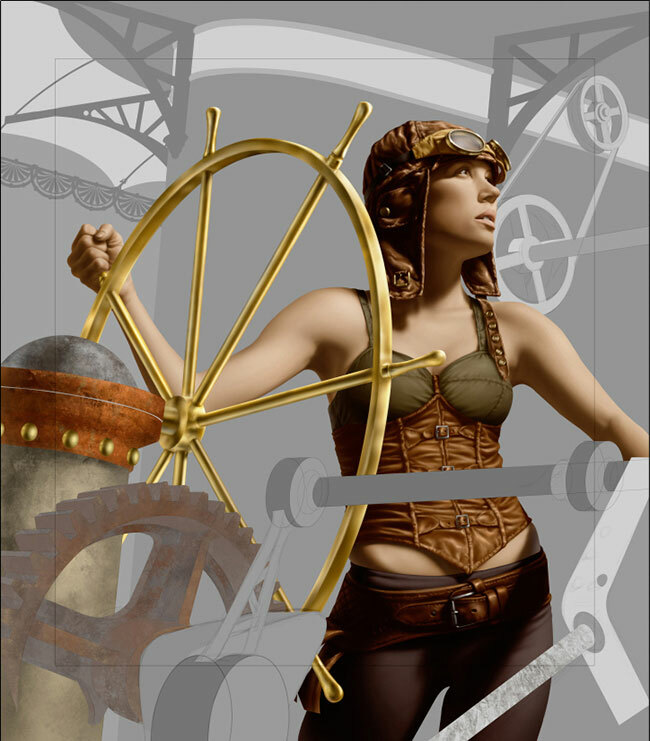 The composition was almost there: the problem with doing an illustration in a theme you enjoy: like: steampunk, created, in my case, some personal issues. How much stuff can I jam in there: I did mentioned earlier that I LOVE the steampunk theme: therefore: cogs, gears, rivets, brass, rusty metal…, so how much “bling” do I put in and still retain a final look without looking too busy. 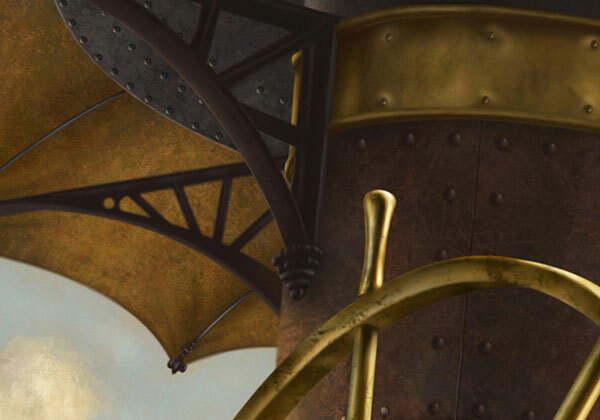 Just so you know: I employed a lot of self control (mostly dictated by the deadline): maybe the next steampunk themed image: I’ll let it rip! 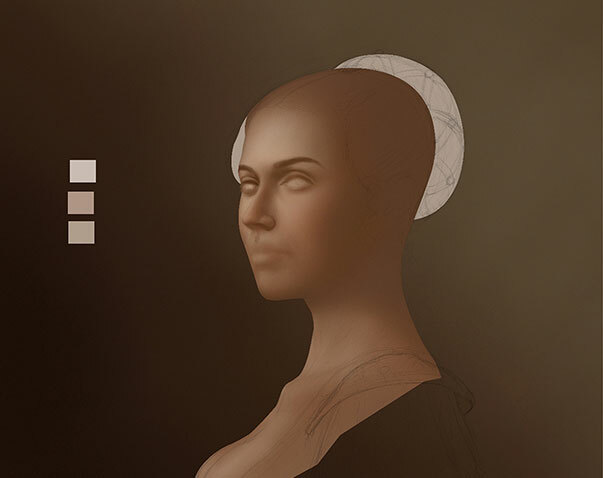 Like most of the images I created before: I block the areas that I need to paint and like most of the time: no colour sketches: I like the process of discovery. First the figure is tackled: after all that’s where the eye will go first. While in art college (OCAD), a great teacher : Paul Young, conveyed the notion of observation which solved all issues regarding painting any material. What does velvet look like, what does steel make you think it is steel? 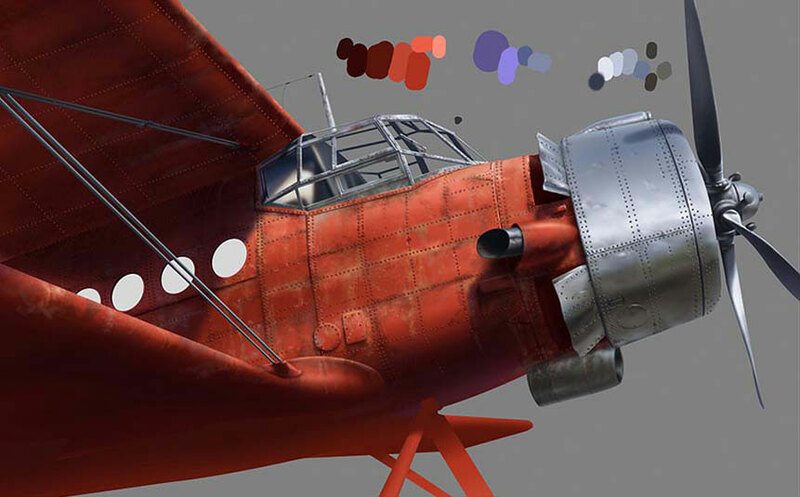 By observing lights and shadows one can tackle almost anything in the process of rendering. I spent a lot of time in art galleries and art museums: the MET, the MOMA, The Frick in New York and so much more. 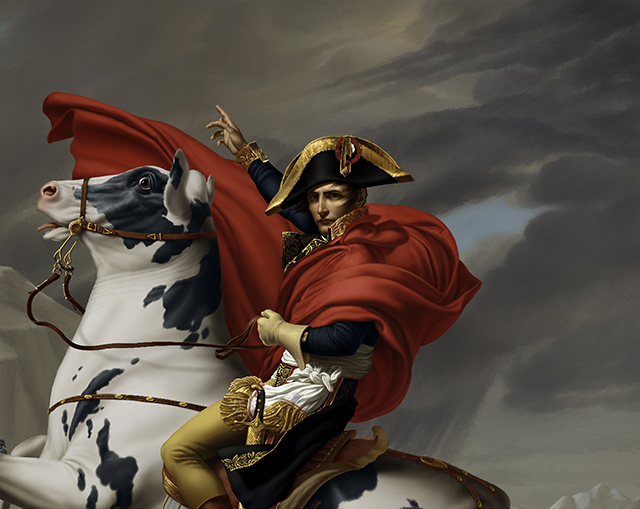 A lot of painters had a big impact on me and I should list some of my influences. 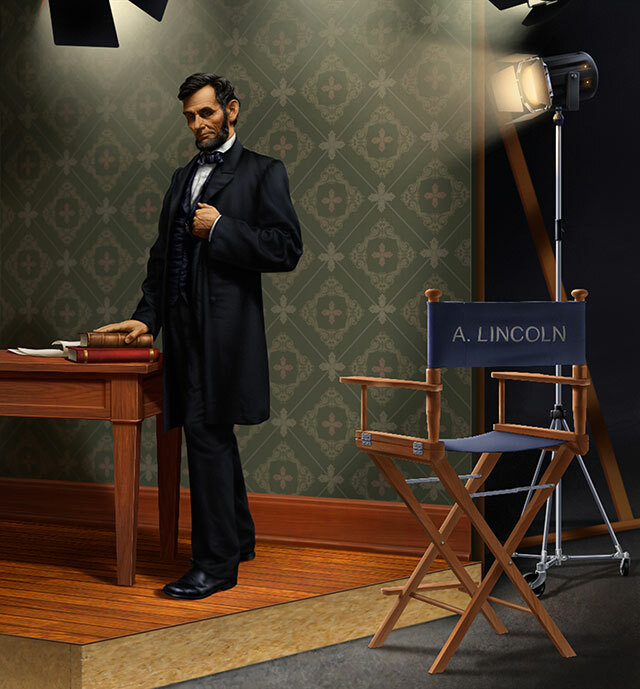 As much as I am a big fan of the great icons of illustrations like: Edwin Austin Abbey, Norman Rockwell, Dean Cornwell, Frank Brangwyn, J. C. Lyendecker, Maxfield Parrish, N. C. Wyeth and some more recent illustrators: Mark English, Bernie Fuchs, Brad Holland, Thomas Blackshear and so on. 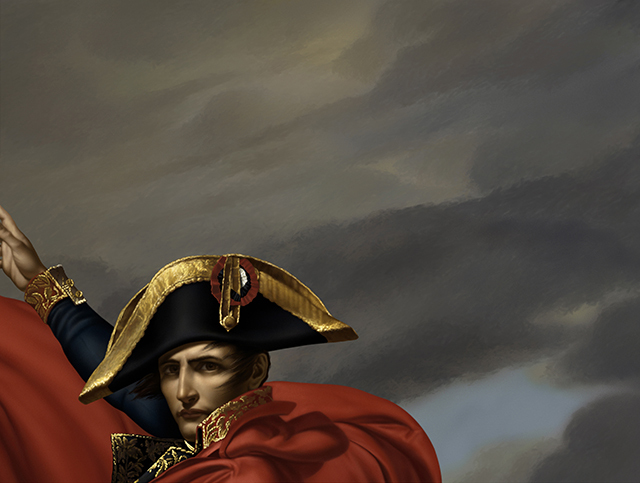 Even if I have such respect for the illustrators mentioned above: I draw most of my direct answers from some of the big names from history’s painters. 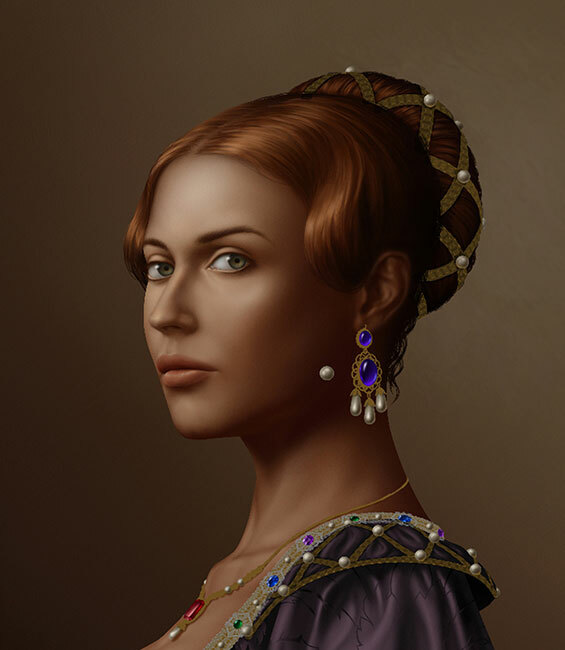 Painters like Johannes Vermeer, Caravaggio, J. W. Waterhouse, Annigoni, Alma Tadema, Bouguereau, Frederic Lord Leighton, Mucha and John Singer Sargent, Van Dyck, etc. As much as I appreciated such a wide range of art: from classical, Monet, Matisse to Lucian Freud and abstract art: the painters that I listed are for my illustration assignments and immediate needs: a source of inspiration and in a lot of cases: the solution of many visuals issues. 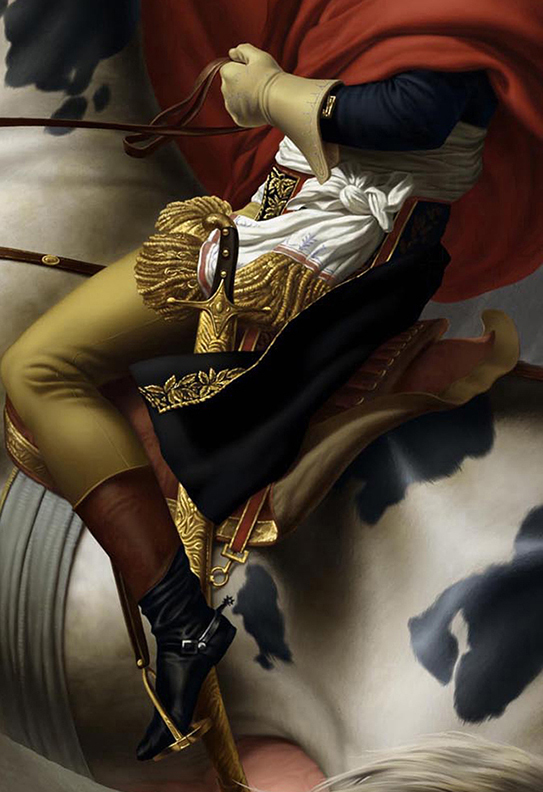 The reason why I brought up all these names of illustrators and painters is what I learned at art college and what I observed looking at paintings: we are painting an illusion: the belt is not leather: but it has some of the characteristics of what leather looks like. That is a little pleasure I get from painting different elements and hopefully give these elements their appropriate perception. I remember coming across a Norman Rockwell show in Battery Park in New York, years ago, and admiring the level of skills that Rockwell had: the shoes look like leather, the wool or cotton look like what they were suppose to look like: observation, analysis are the answers of depiction. 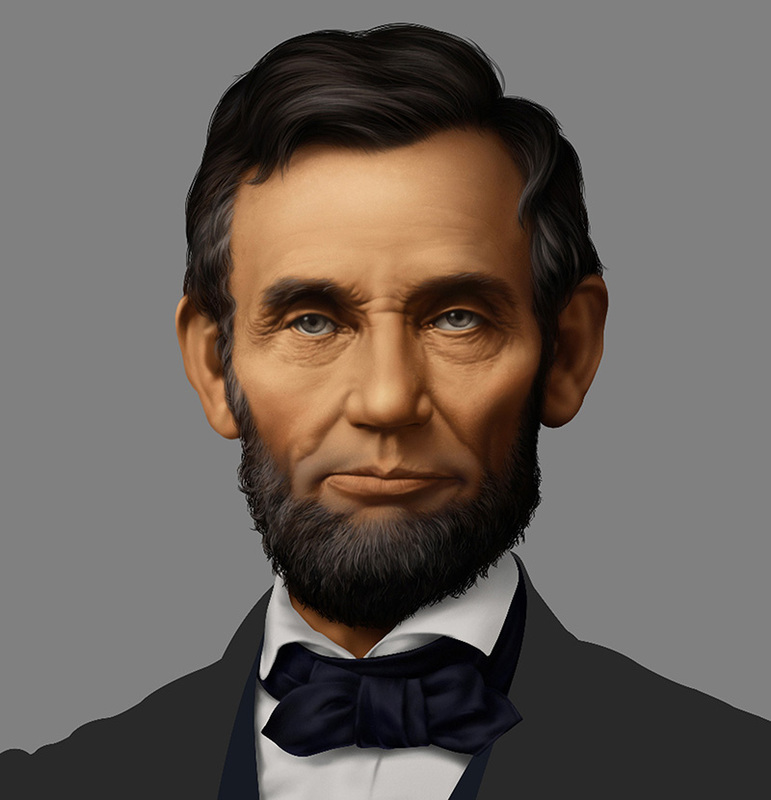 Don’t get me wrong, I like the impressionists and a lot of different art movements: as it refers to the realist style that I use: those illustrators and painters have shed some lights in my process. 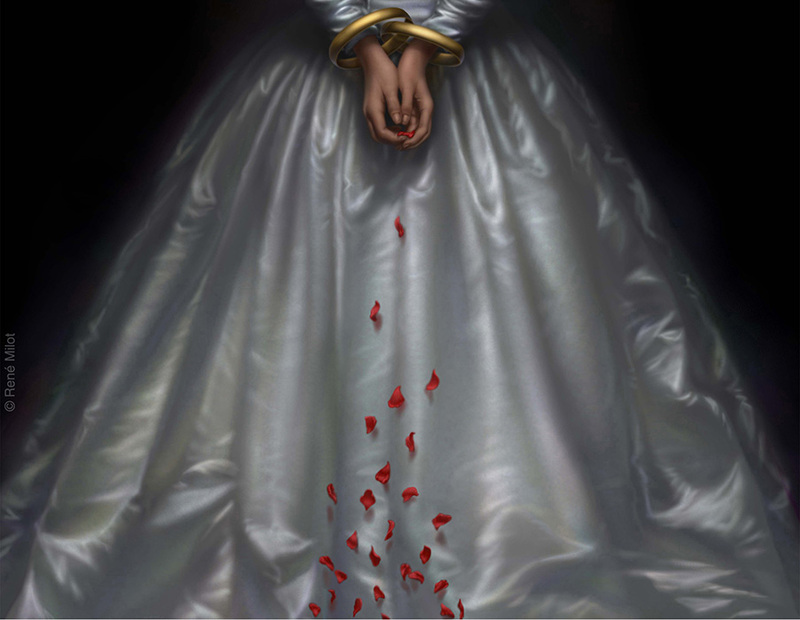 Bloody opera: Lucia Di Lammermoor! One of the aspects of freelancing that I like: is the pleasant surprise of a new assignment: one never knows what’s coming up next. For many years, I have been contacted by several Opera houses across the USA and Canada to promote upcoming operas. All of them have been a blast to paint and fun to work on. First let me admit to a little truth: I do not dislike opera as an art form: just no a big fan. I highly respect the vocal talent of the performers, I like the music, like some of the theatrical presentations; simply a respectful appreciator of operas. I do love the dynamic of the storyline of operas: because they are rich in visuals: settings, era, etc! For those of you who are not familiar with operas and some of their story lines: in a lot of cases it revolves around a love triangle: boy loves girl and other boy loves the same girl: etc, with some variations. Of course I’m making a rough generalization; but you get the idea. 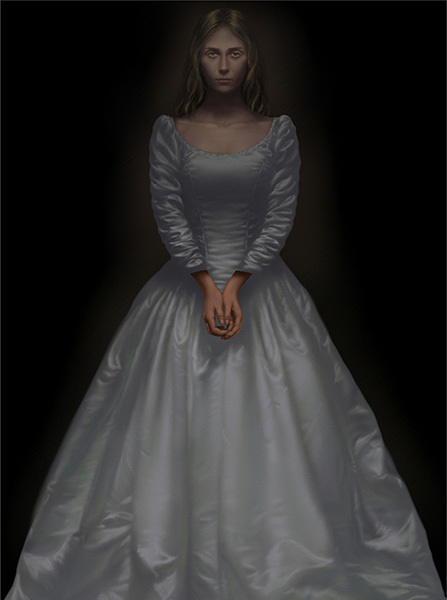 I was contacted by the Cincinnati Opera to create a visual for the opera: Lucia Di Lammermoor. In the multitude of operas out there: this tragic opera (Lucia Di Lammermoor) is known as a “bloody” opera by some people. It is a 3 acts, tragic opera, written by Gaetano Donizetti in 1835: based on Sir Walter Scott’s historical novel The Bride of Lammermoor. Here’s the quick synopsis: there is a feud between two Scottish families: the Ravenswood and the Lammermoor: Lucia is forced into a loveless marriage: she goes nuts and killed her new husband on their wedding night…! 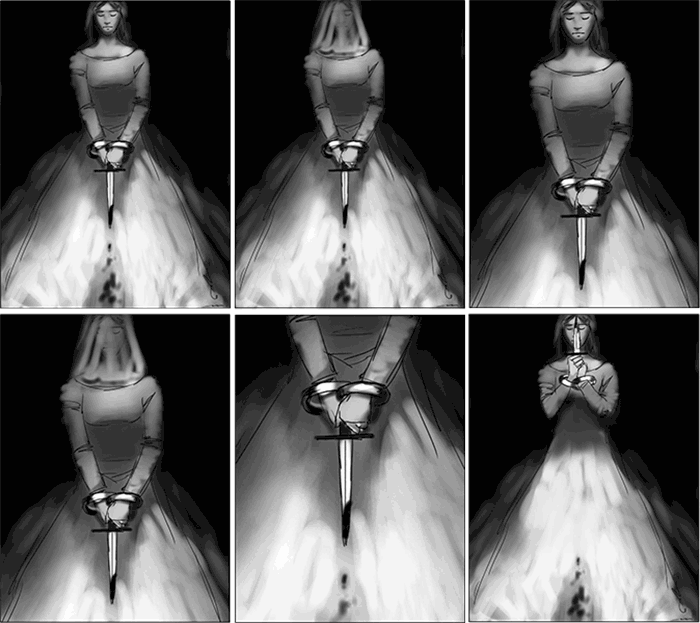 Here are some of the quicks sketches done for the client’s presentation: when dealing with an opera poster: one thing to keep in mind is that the image should feel familiar to the opera loving crowd. Also it should have an intriguing appeal for the viewers who are not knowledgeable about that specific opera or if we’re lucky: attract new converts to the opera. Because of the story of Lucia Di Lammermoor: being rather violent: killing her husband on their wedding night: it’s almost inevitable to choose that part of the opera as an iconic situation to create drama. 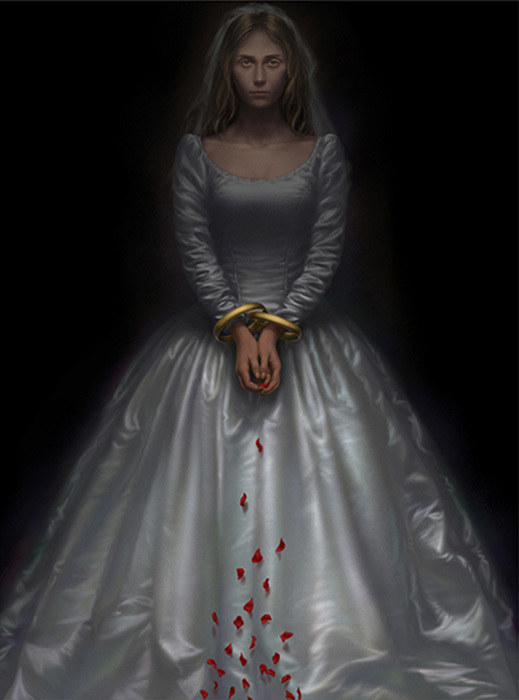 I opted to use the wedding bands as handcuffs to show the desperation of her captive situation. As discussions progressed with the Cincinnati Opera (great people to deal with): the dagger was removed and what was drips of blood on her wedding gown. After some back and forth: they wanted the “violent” aspect of a blood stained dress toned down: so flower petals replaced the blood drops: to make the image more neutral for the general public. Compromises are inevitable sometimes. 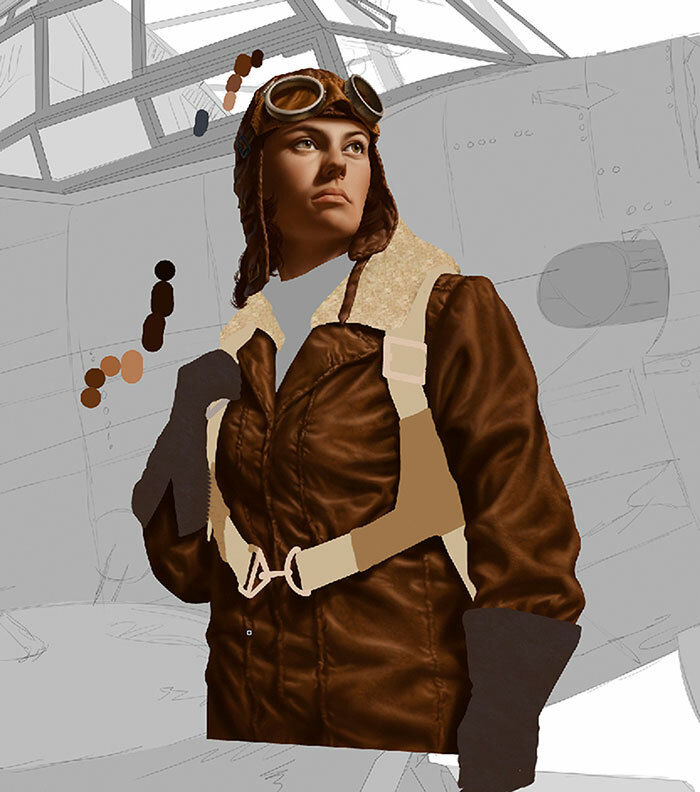 Starting to block in the colours and tones. 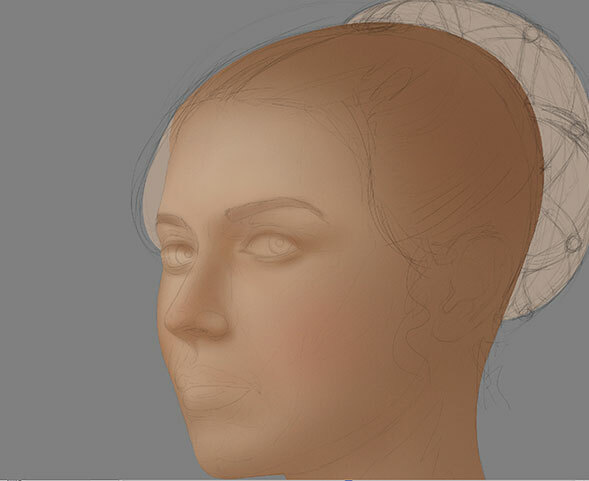 Slowly deepening the elements. By doing that it helps deciding the importance of some elements as to their perception order. Starting to punch highlights and contrasts. Addition of the wedding bands and starting to add some iridescent colours into the white dress to add some interest. It breaks down the monotony of just plain white. 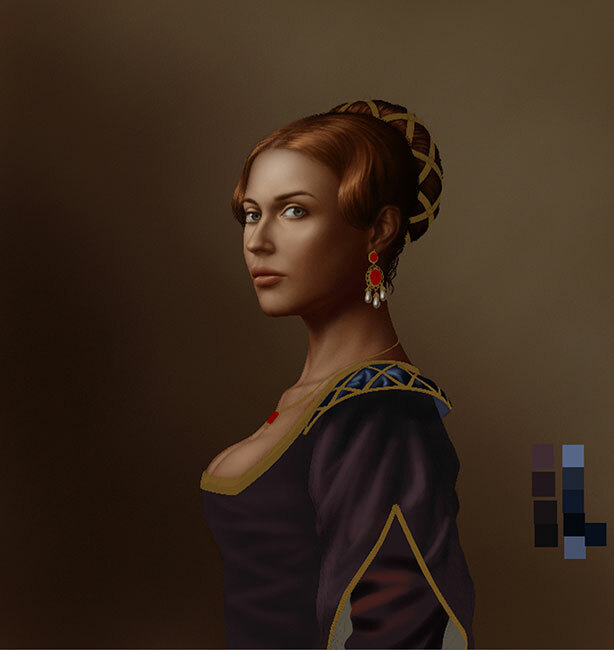 By “pumping” the dress in certain areas; it helps to draw the viewer’s eyes to different “hotspots highlights” to fight the stilness of a central figure. I have to admit that I like the way these subtle colours to the dress add interest! I was recently watching a tutorial on line ( about a 3d program) and I kept saying to myself: how lucky we all are to have access to a multitude of knowledge out there! Therefore let me say it again: I’m doing this blog because I wished I had that type of information when I started painting; years ago. I hope that the process that I’m demonstrating helps convey a message that any image one is working on has a story that is often more than the final result. As much as the end result is what keeps food on your table and the phone ringing; your personal journey of creating that image is always the benefit. 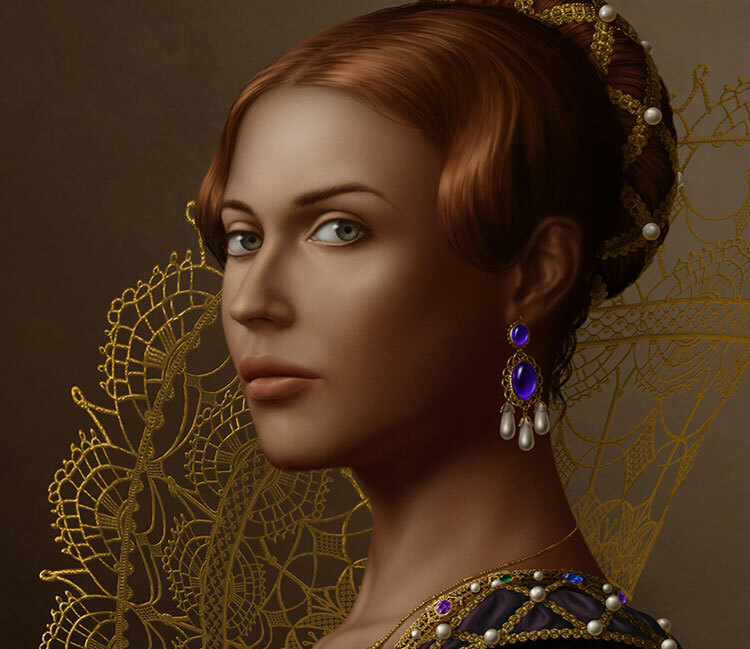 The gilded cage was an assignment, it needed to reflect a “period” illustration about the life of a wealthy family and the emotional struggles and social obligations of one of the daughters of that aristocratic household. 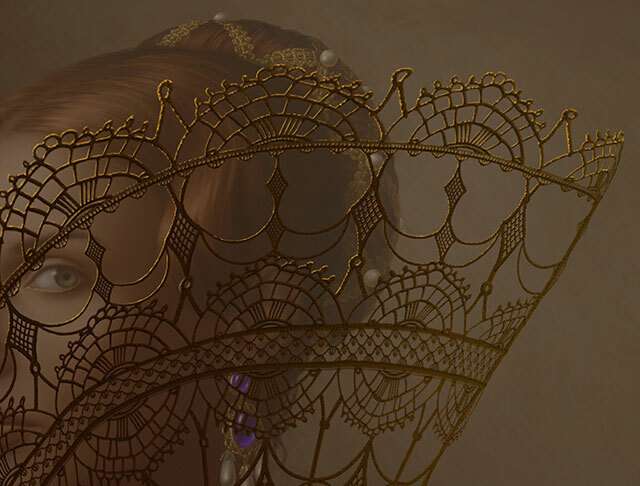 From the initial discussions I roughly knew that I wanted to utilized elements of the surroundings or other parts of their lives to connect the figure to the world of opulence she lives in. After several rough sketches what came clear to me was the concept of using something that defines a lot of people on a daily basis: most people judge and are judged by what they wear (sad, I know): so for this assignment what would be viewed as apparel could also be used as the conceptual device that while remaining a “period” portrait, could also convey a message. 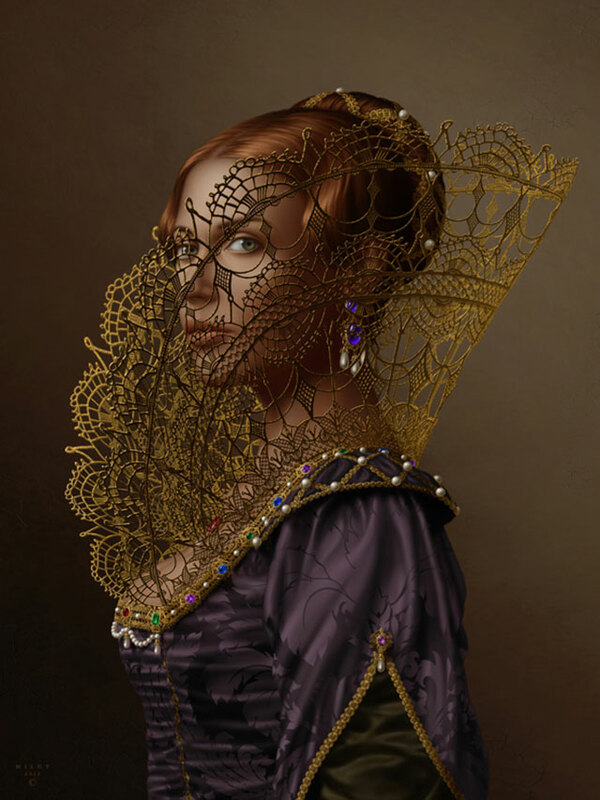 Using the lace collar as an obstacle that one can hide behind or peek through carried the message I wanted the viewer to see: that behind all that glitz was a look that connected with the viewer: a peek behind the curtain so to speak. Sketches to me are mostly a way to corral ideas: they are usually very simple but have to work at that level of simplicity. 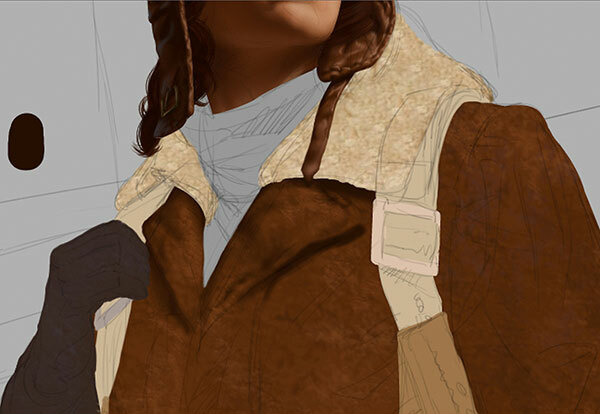 Funny how I tend to go nuts on details while moving on to the final artwork. 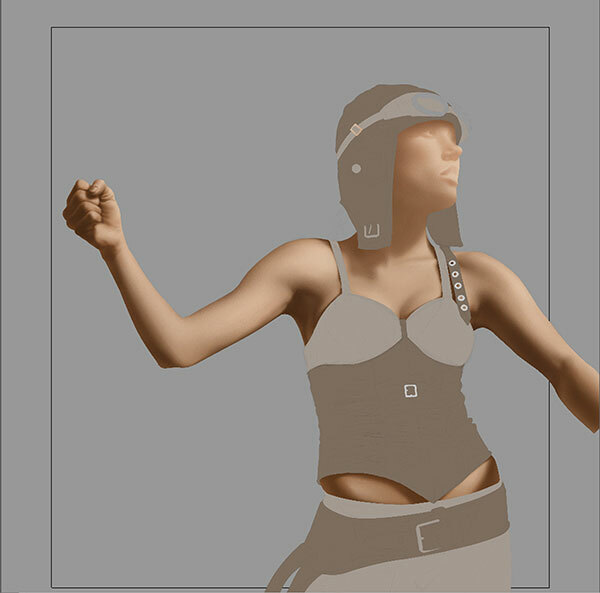 Now that I have a better idea of the shapes that I’m shooting for: the real work starts: actually let me correct that: I should say that finding the concept is the “real” work: rendering is the “grunt” work. 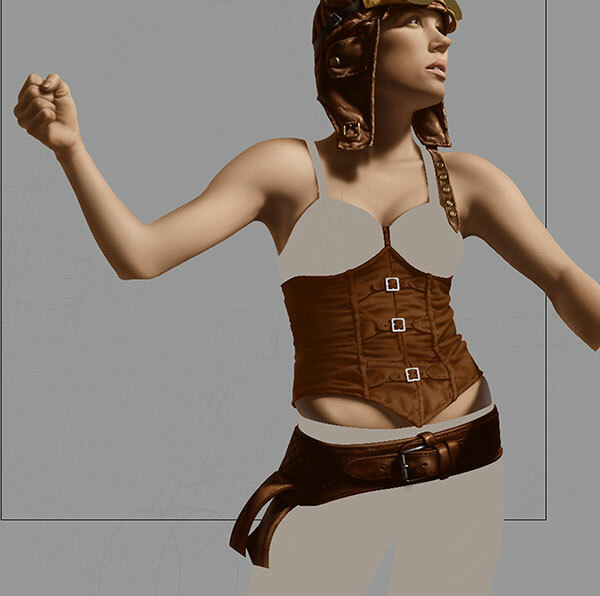 Unlike most of my illustrations I did not have a model to pose for pictures for this project, that meant with the help of a few reference from my folders and a lot of drawing, the process of getting started was a bit slower than usual. 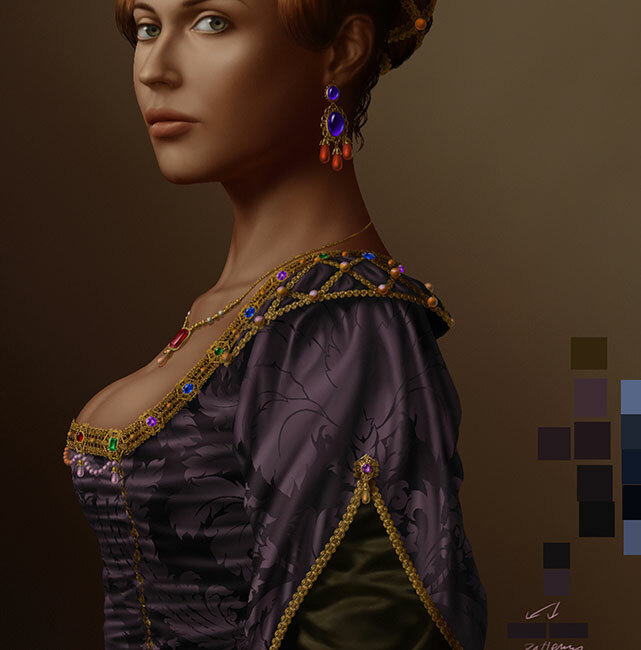 At one point I was trying to figure out if I was going to have the clothing toned down to let the figure shine through and I opted to pump up all the clothing and jewellery to depict the full opulence of her surroundings and way of life in contrast to the solitude and isolation she felt. 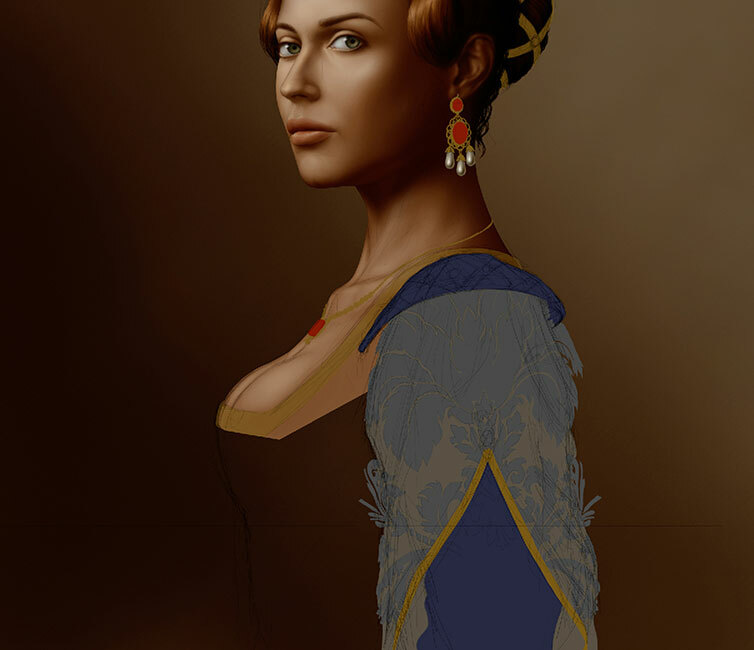 Adding patterns to the dress. 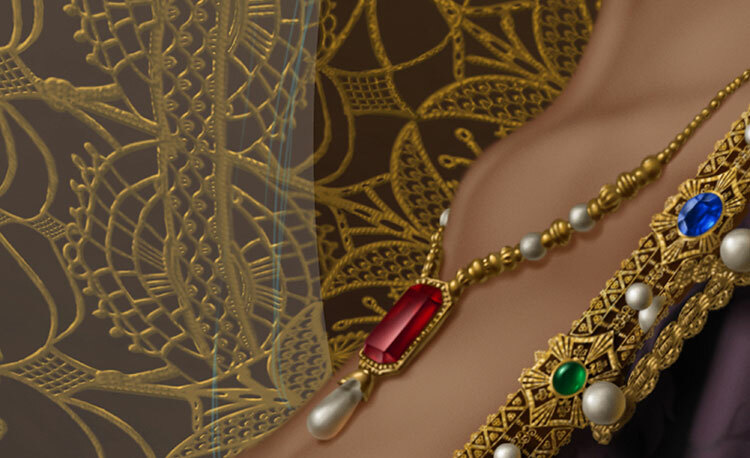 Now time for the jewels and so on. As one builds up an image, in my case anyway, it seems that amnesia strikes me and realize that all these details take a long time. That’s when “cut and paste” becomes my best friend: it makes the process faster and tweaking later becomes a viable option. 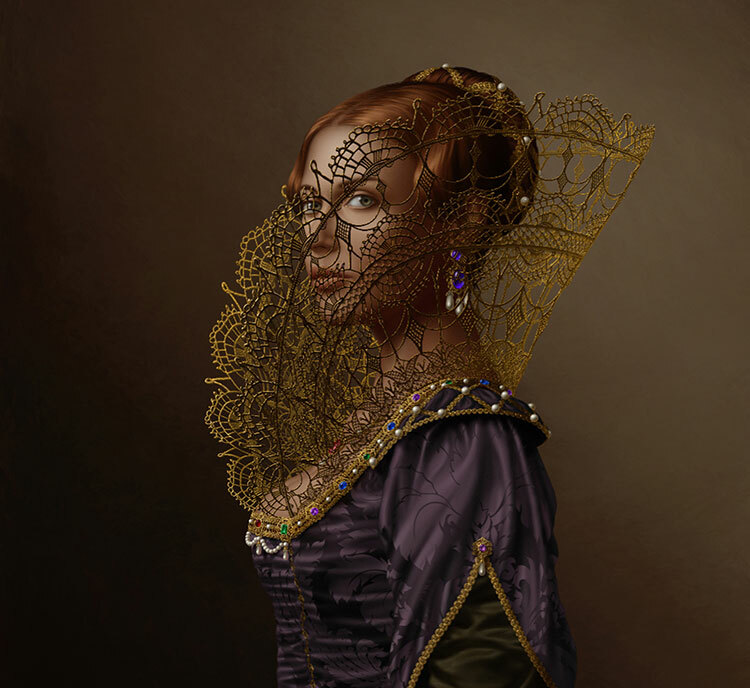 Now it’s time for the dreded lace collar: because of the title of the project: “the gilded cage” had to be golden. Using some textures I had and adding to it to fit the look I was going for I wish I could say that after doing the back of the figure it was just a case of “cut and paste”! No it was not: a lot more tweaking was involved. 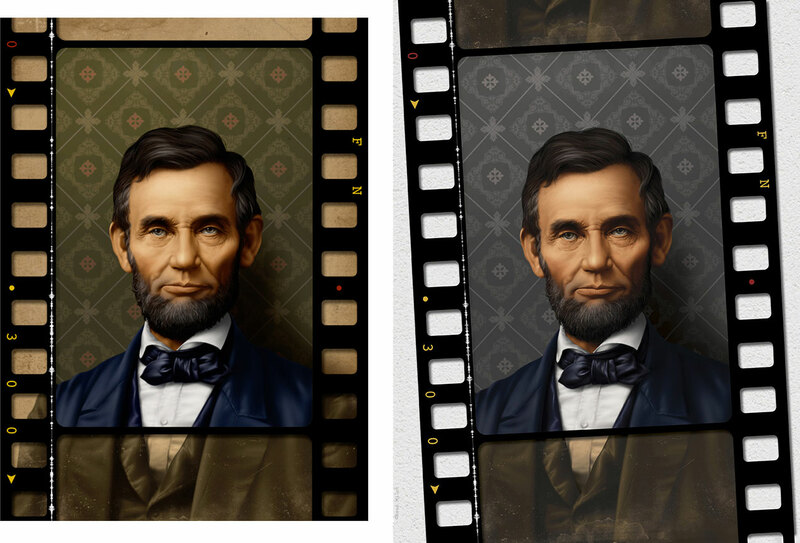 Adding the highlights was a pain: for those of you that work with Photoshop and or Corel Painter (my main tool) there are multiple ways to create some highlights. Tried a bunch of tricks: it looked too mechanical, at the end there was a lot more work in front of me. One of my great instructor at OCAD, Paul Young had said to us about painting/drawing: “some parts will come for free and others you’ll pay the price”. That collar cost me a lot. Here’s the final illustration un-cropped: because I mostly work for print, there is always instances of needing extra bleed for wrap-around, or additional typography, etc. http://renemilot.com send me an email and I’ll be glad to give you prices and options: paper, mounted canvas etc. 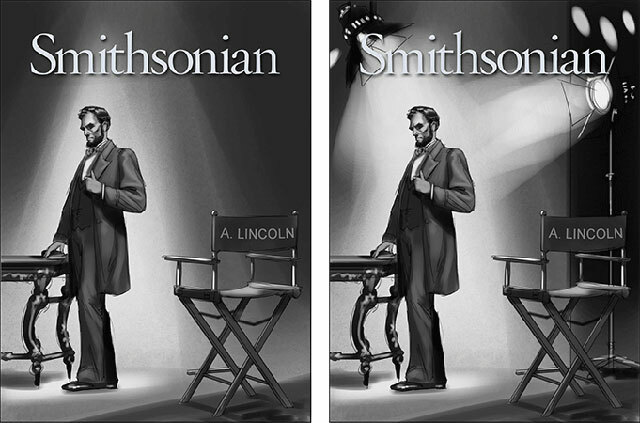 Because I submitted a lot of sketches for the cover illustration concepts (previous post: Mr. Lincoln goes to Hollywood (1 of 2)), the people at the Smithsonian magazine asked me to do an additional illustration to accompany the article inside that issue to precede the release of Steven Spielberg’s Lincoln. The idea was to depict Abraham Lincoln (the real Lincoln) on the set of a movie. 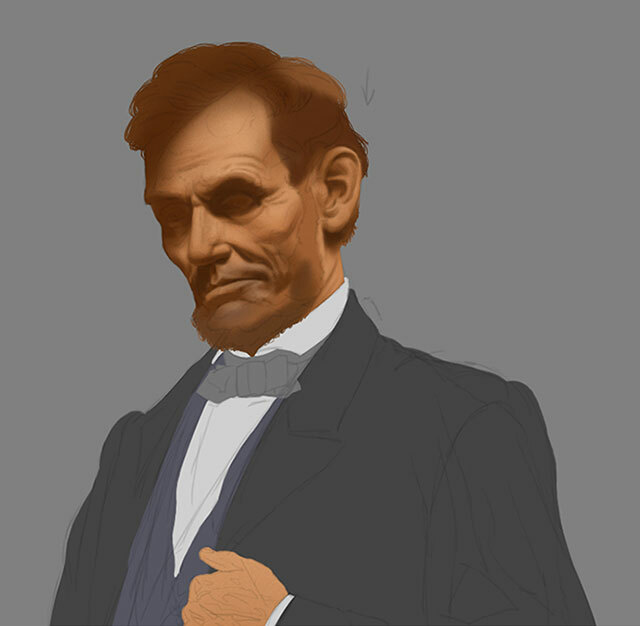 It would have been too easy if there would have been an existing picture of Abe Lincoln in that pose: matching my sketch. Of course not: somehow I always seem to pick the “long way home”! 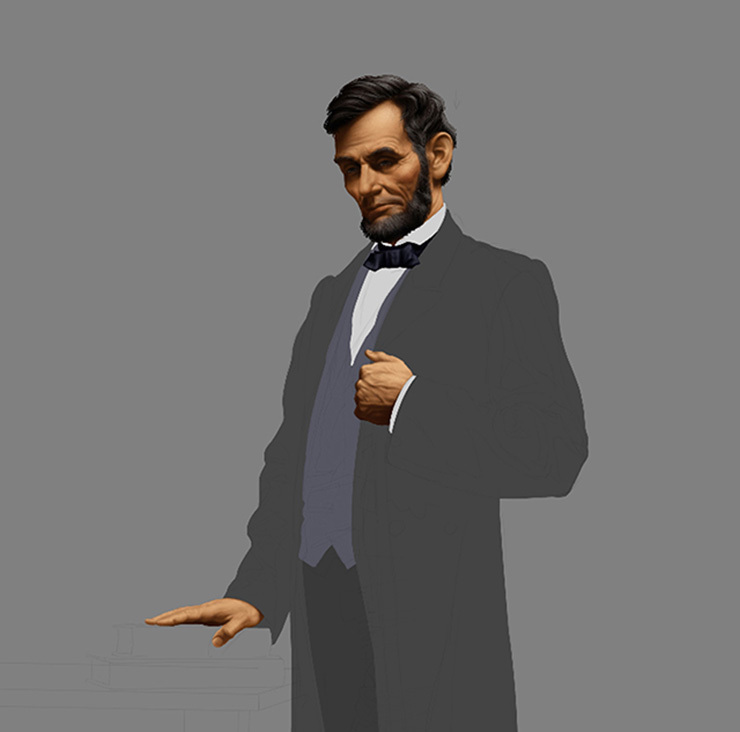 Hopefully there are a lot of images of Lincoln out there and with all of them get the information to create a “new” image of Lincoln. I asked a very good friend to put on a suit jacket, drove to his house: took a quick digital picture of him next to his dining room table (5 minutes photo shoot) and boom I’m out of there. 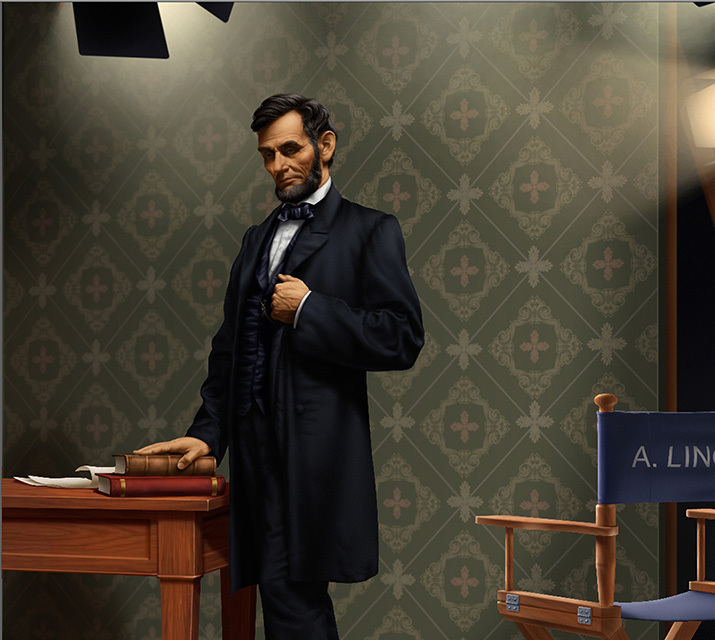 It’s enough information for me to “make up” Lincoln’s jacket. Now for the background; pump up the final elements and we’re good to go! 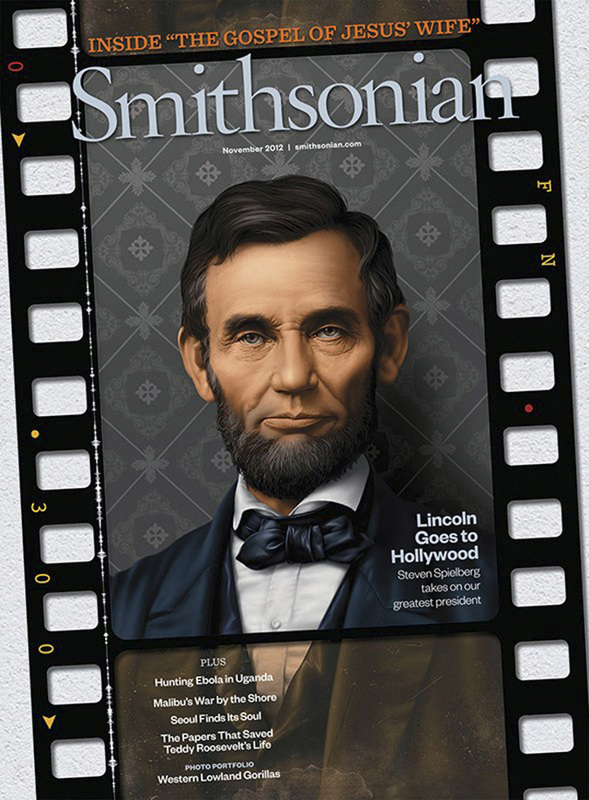 A while ago, I was contacted by the Smithsonian magazine to do a cover illustration for their article about the upcoming movie by Steven Spielberg: Lincoln. 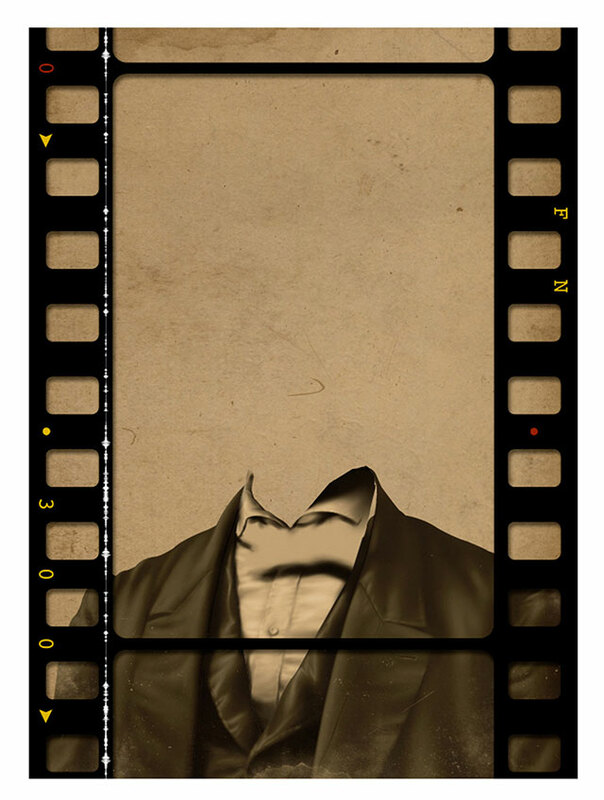 After the editorial brief, based on the working title: “Mr. 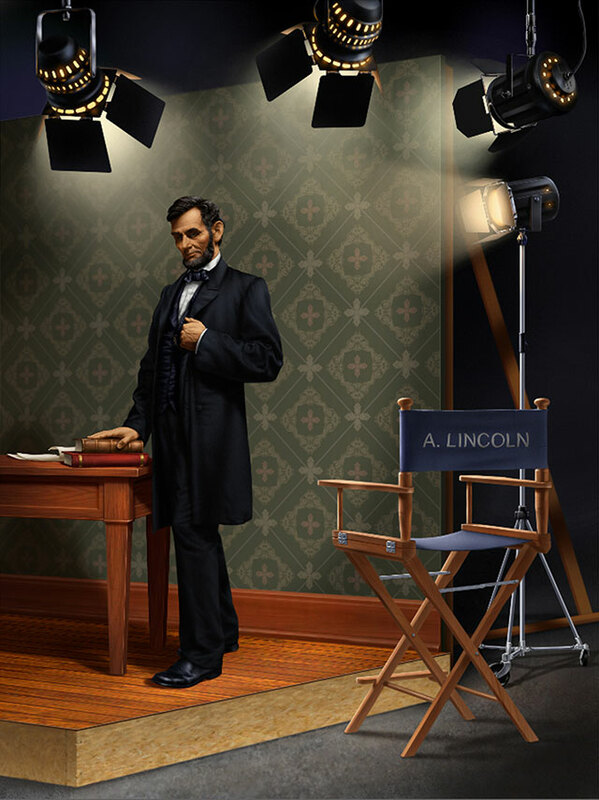 Lincoln goes to Hollywood”, I provided them a series of sketches based on the instructions and guidelines provided to me by the art director ; as always: I did some very simple sketches with enough information to get the idea across, featuring of course Abraham Lincoln. After viewing a lot of proposal sketches, the editorial selected the sketch above (on the right) that fitted their requirements. 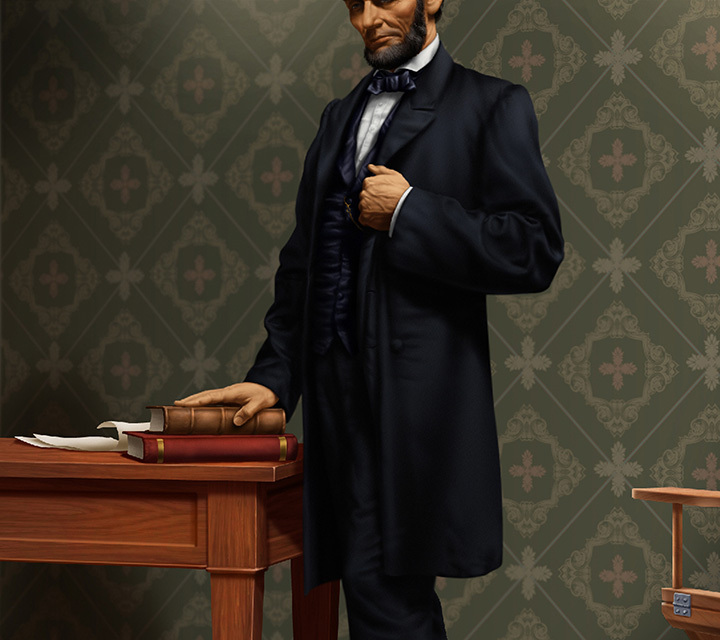 There are a lot of pictures of Abraham Lincoln, lucky for me after a lot of research found a reference that I could use legally. 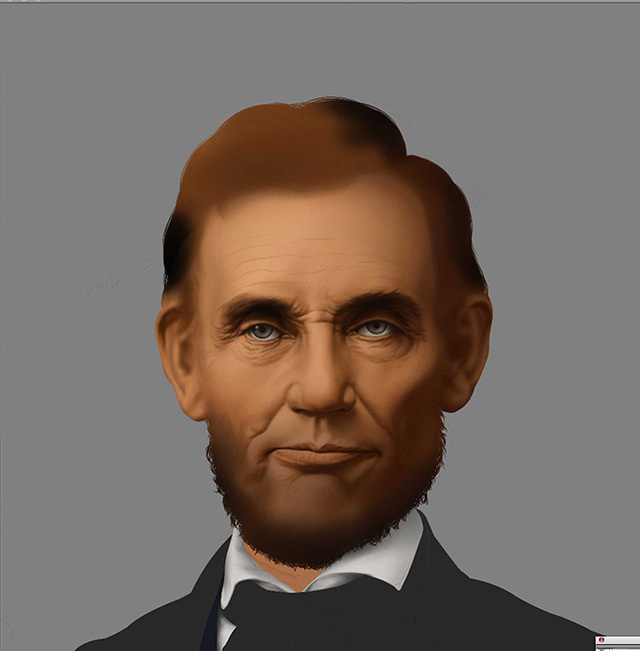 Of course we are all familiar with that photo of Lincoln, I had to use the reference as a base and put an interpretation for the illustration that was not too far from the actual photograph but with enough small variation to make it my own. 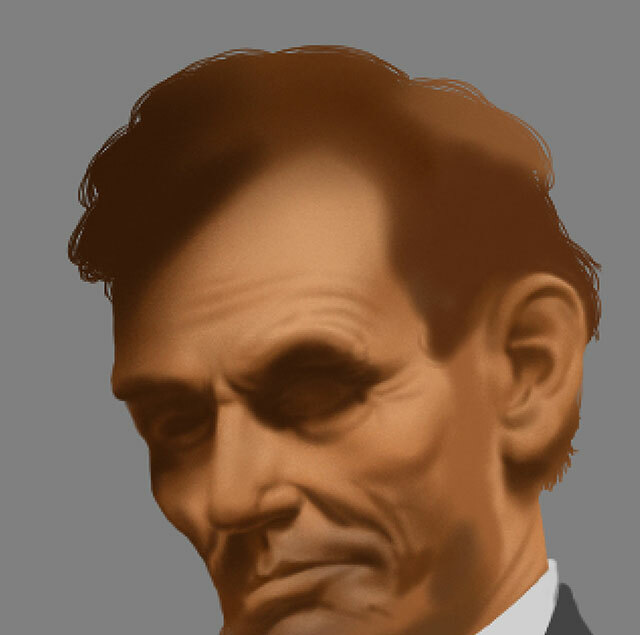 I also looked at other pictures of Abraham Lincoln depiction: mostly sculpture, because the reference is rather flat for information, by looking at sculpture of Mr. lincoln, it gave me other interpretations of the man’s face as guidelines. 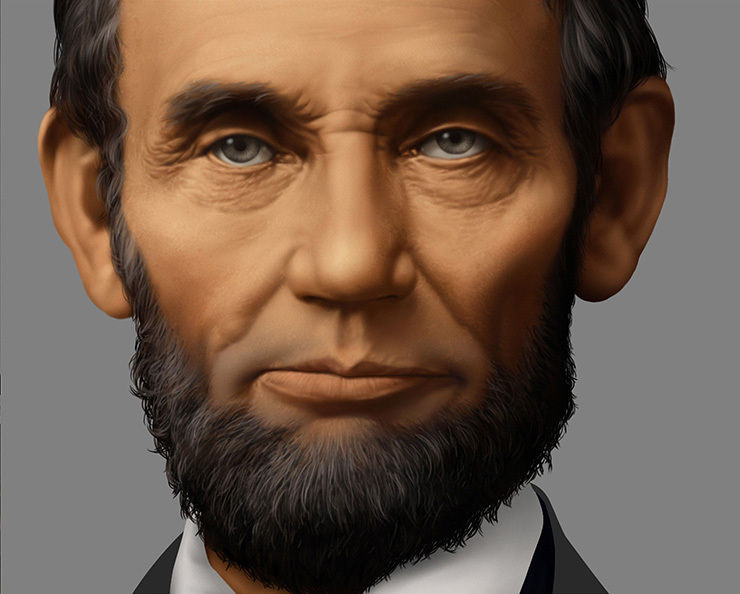 Because we are all familiar with the existing depictions of Lincoln, little details always come up when one does illustration: what colour were his eyes? 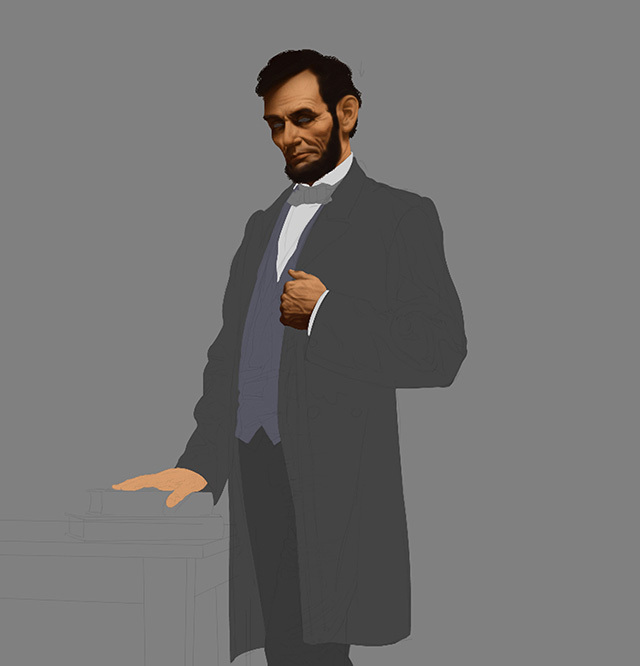 These are small details that always come across the execution of any illustration for an illustrator. I love the internet: the best tool ever for research. Why do I bother being diligent when I do my assignments: probably by my nature and also my many years of doing commercial illustrations. The last thing you want; is to have a phone call from the client after the delivery of the final art and having the client asking you: “are you sure about this or that”. 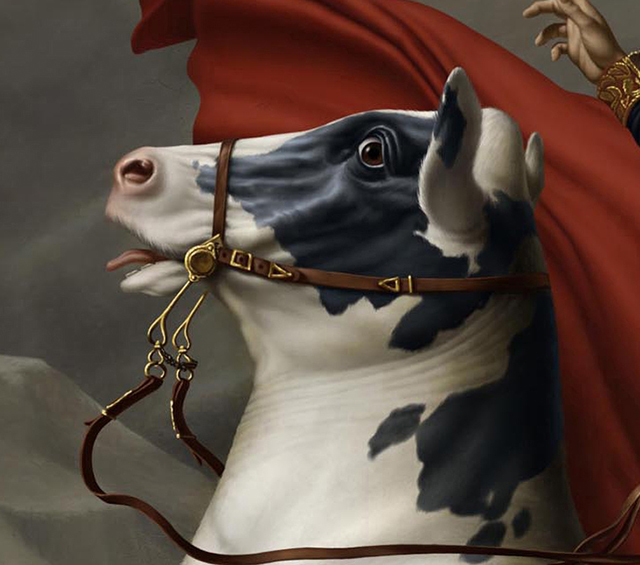 Because I started my carreer painting in oils, I realized then that it was easier to research any project properly, rather then correcting later… in oils. 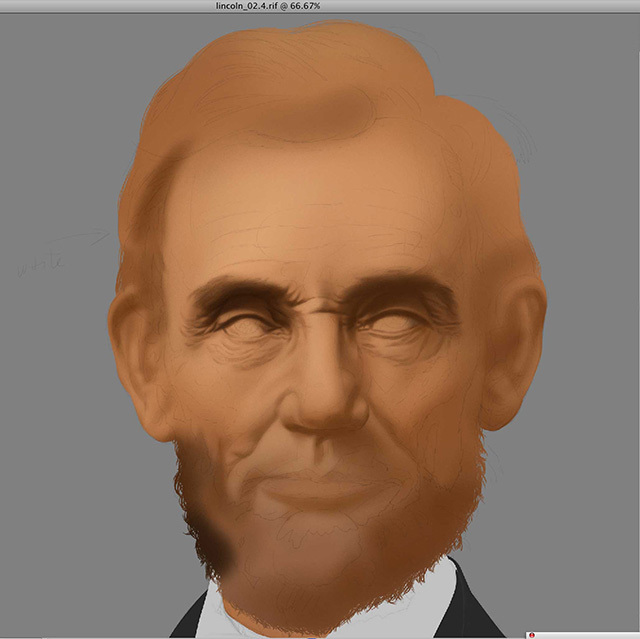 Time to add skin textures and defining some wrinkles: a bit of humanity! According to the client’s choice; they opted for the sketch with a film strip to be part of the concept. 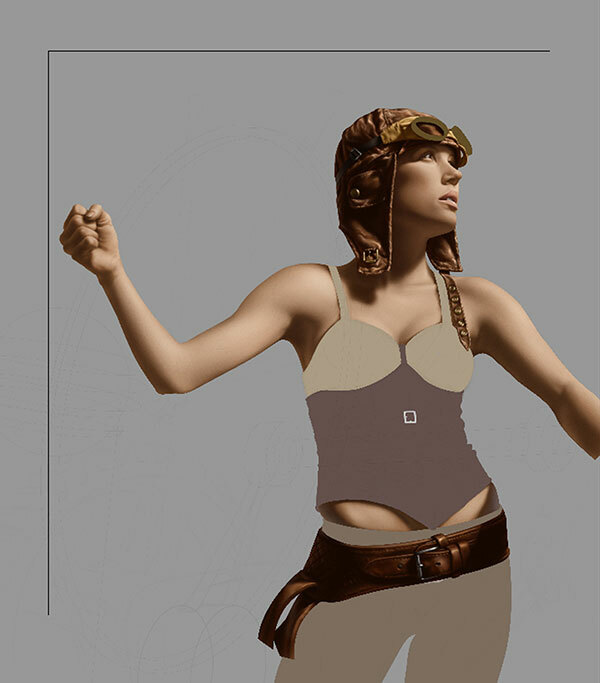 I also added the idea of using the old sepia photograph look as a support to the concept. 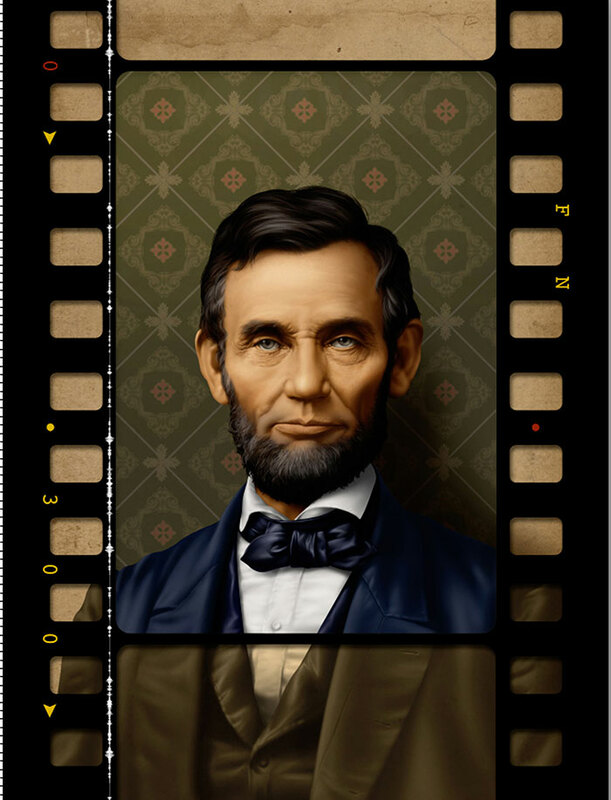 Using the film strip as a frame to enhance the idea of an historical figure coming to life. 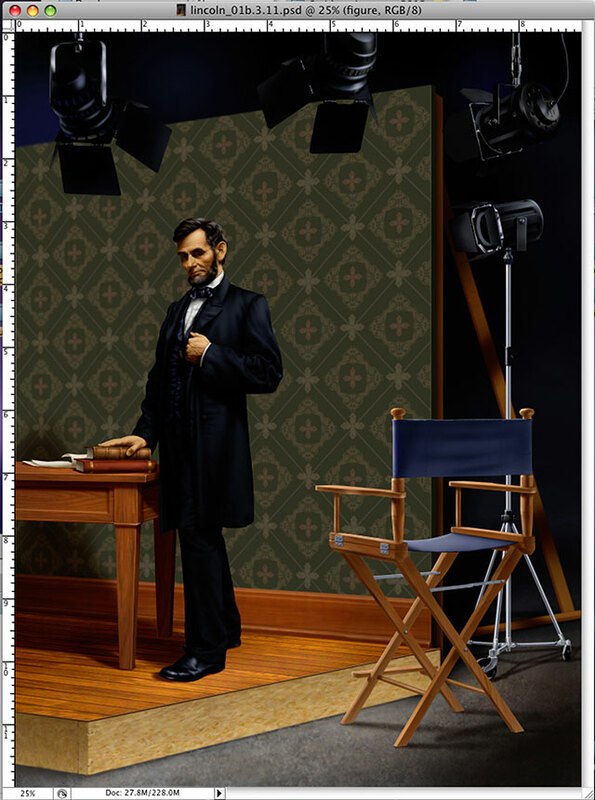 As it stand at this point: this is how the illustration of Mr. lincoln was delivered to the Smithsonian Magazine. 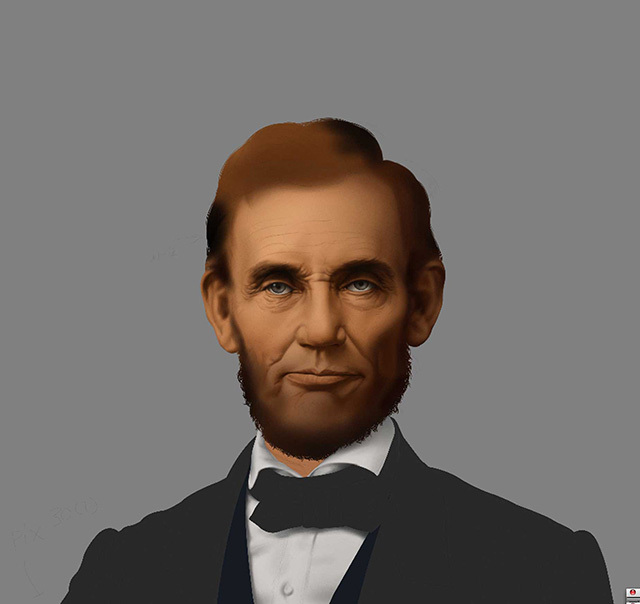 After discussion at the editorial level, as it happens often, a variation from the original approved sketch; was requested. To be fair, they (the client) are the end user of the image, as an illustrator I am aware of that situation having been doing illustration for 30 years: did I agree: not my call at that point! At the end: on the news stand the viewer will never have seen any previous versions. 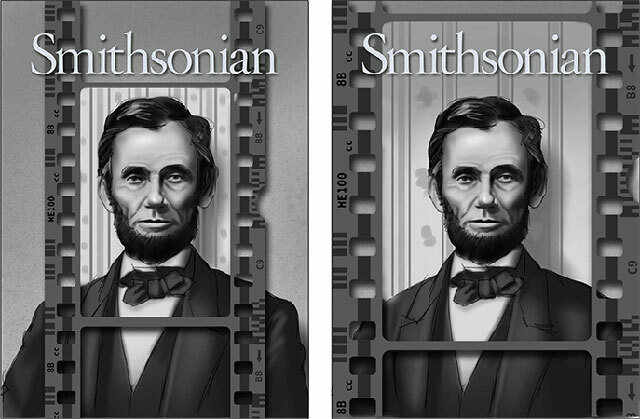 So here are the final version and the revised version (right) as requested by the editorial staff. Sorry for the late post: been so busy with work: time just flew by. 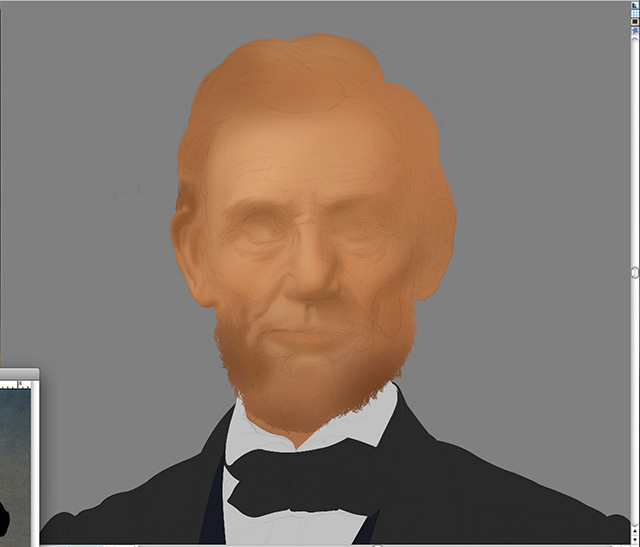 Now comes the background completion. As I stated earlier because the image was to be used in multiple applications: bus shelters, posters, etc, it made the file huge! 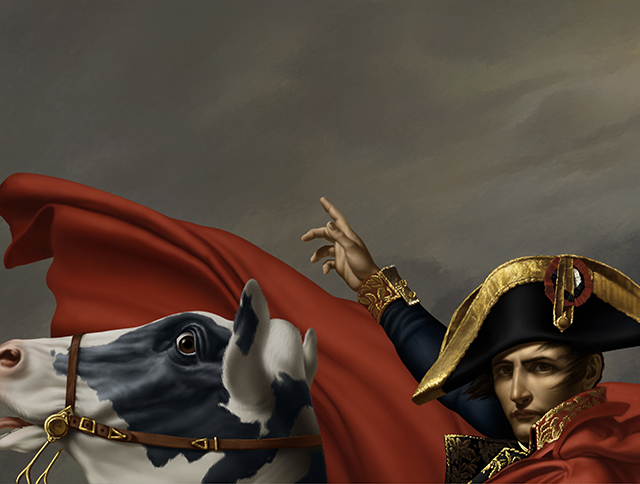 Complicated by the fact that I was emulating the painter style of Jacques-Louis David, therefore it was a time grabber. That was way too many brush stokes… . 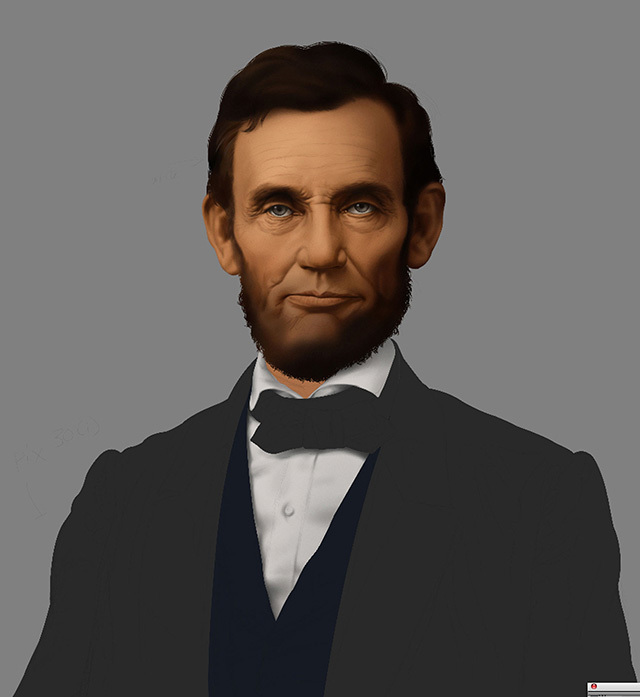 Even if I had a brush in Painter that was close to what I wanted to execute the look I wanted: there was a lot of tweaking and back and forth. 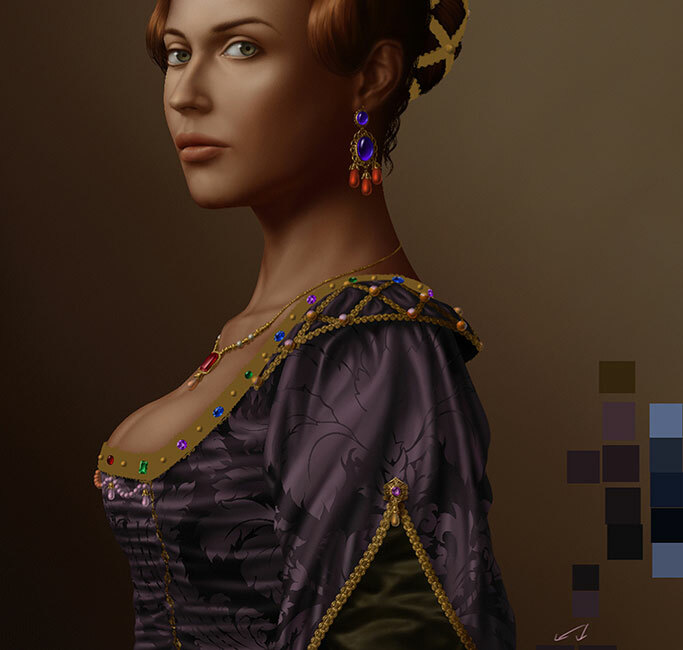 Because this project required some likeness to the original painting came the task of revisiting all that I had painted/colour blocking so far and retouching almost all the painting with brushstrokes to keep the entire image consistent. 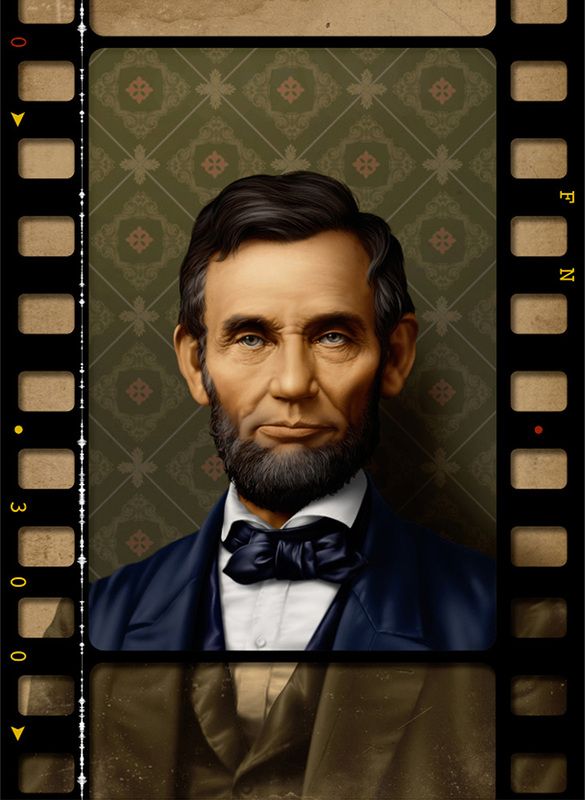 Because the illustration was going to be seen unclose, creating the illusion of being an actual painting: I added, varnish cracks, canvas textures and yellowing of old varnish is some areas to give the image that illusion of being an old painting. With a bit of manipulation in Photoshop, it gave it a cool touch. Finally it’s done; it was a challenge from many aspects not to mention the sheer size of the image: at the end the clients were happy and so was I. 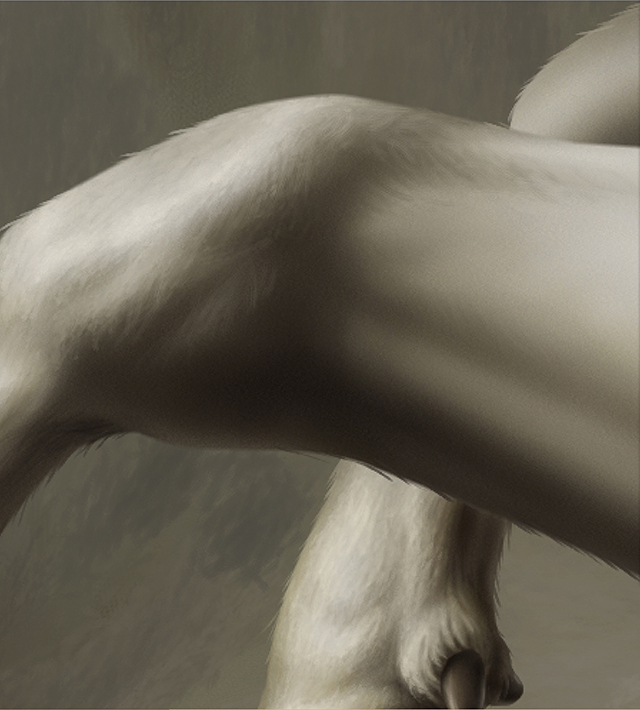 Just a few grabs of some of the details of the painting.